Ticker Sense: Short Term Top or Technical Coincidence? Short Term Top or Technical Coincidence? Aside from being a volatility indicator, we believe that the VIX index should fluctuate based on market moves and not necessarily on trading or technical patterns. 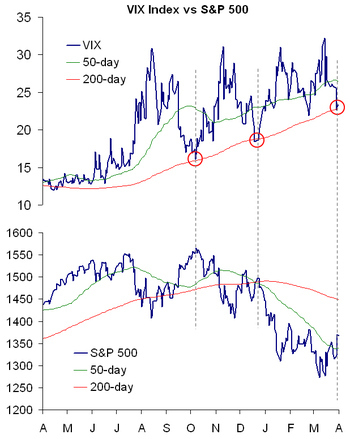 Where it might be somewhat normal to see a stock bottom at its 200-day moving average, we would expect a more descriptive indicator such as the VIX to trade through moving averages as if they weren't there. Since the July correction of last year that has not been the case. As shown below, the VIX has bounced off its 200-day moving average twice since last July, and each time it has rallied back to highs. (The pattern eerily resembles what technicians and chart readers call an "ascending triangle.") It has currently bottomed on the average. This is not to say that declines are imminent, but it is worth pointing out that the two previous occurrences resulted in declines. Thanks for the tip. I think it is because there is more technical-oriented players in the market than before. Interesting situation but technically there are some opposites. Thanks for sharing your observations though. The SP500 200-day MA is currently sloping downwards, opposite to the two previous two instances where it was going up (October and mid December). Increases in volatility then, resulted in price falls. By analogy, today, when the Sp500 200MA is downward sloping the opposite should be happening i.e. increases in volatility should result in price rises ( I say "should" in a sense only to make this picture balance perfectly). Yes, I agree - interesting observations. I just read an article that somewhat contradicts these findings at fisher-investments.typepad.com. Basically, what they were saying is that depending on the area of the economy you are looking at, things could be in really bad shape, not-so-bad, and actually there are areas that are in really good shape. Their view is that we bide our time and wait this one out to see truly where the numbers lie in the coming months. VIX broke sharply below 200 day MA today, just like in August '06. Put on yer rally caps. I checked out the article referenced above: http://fisher-investments.typepad.com. It's so interesting how people are reacting to this market. There are other bloggers out there (Warren Buffet fans especially) that have already thrown in the towel and are calling this a recession. We'll see. This is a good article. I agree, if there is a method of saving costs then I am all for it. The last place I would have thought to notice a disease was in the eyes.